A zoning change will be held to consider amending the zoning from R-5 Residence District to C-1 Office-Residence for property located on the west side of Lowndes Avenue between Railroad Street and Columbia Street in Huntington Station. The .95 acre parcel was rezoned in 2011 to accommodate 8 single family homes with 8 accessory apartments known as Columbia Terrace. For unknown reasons after the zoning change, the project was not completed. Click here, to view the video and read about the original rezoning. The 13 minute video clip is worth watching. The plan on the table now is to build 14 affordable ownership units with with a preference to veterans. The zoning change is required because the new development will not be single family homes. The plan is to build an attached townhouse style development with on street parking. The town bought the property from Don Pius for $778,000 under the take back the blocks program. The property is currently tax exempt. A grant in the amount of $1,560,000.00 was received from NY State to complete the original project of 8 single family homes. These funds will be used to complete the new townhouse style development. The firm of Jeffrey A. Hartman, P.E. Engineering Consultants has been selected to provide the necessary professional architectural and engineering expertise to prepare the new version of Columbia Terrace. They will be paid up to $150,000 for their services. The funds for these services will be paid out of the Highview fund. The Highview fund is money paid to the CDA from the Highview development ground lease. Highview is located on New York Avenue in Huntington Station next to the railroad station. 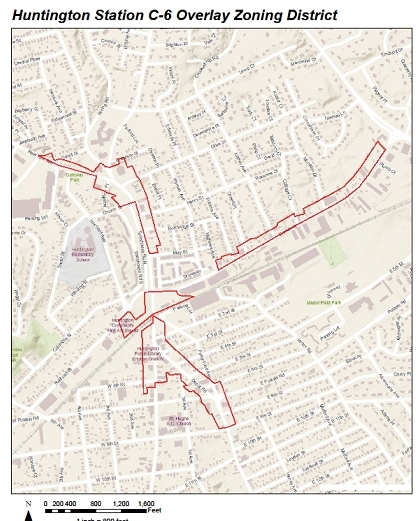 The public hearing is scheduled for December 10, 2013 at 7:00 p.m.
On December 10, 2013 at 7:00 p.m. there will be a public hearing to change the zoning of a parcel in Huntington Station from C-6 General Business to the less restrictive C-6 Huntington Station Overlay district. The town board is considering a zoning change for a parking lot in Huntington Station located on the south side of Railroad Street, east of Lowndes Avenue, next to the Community First Aid Squad. Renaissance Downtowns, who is the Master Developer for the Huntington Station, has examined the potential redevelopment of underutilized government-owned properties located in areas immediately surrounding the Huntington train station. They have determined that the split zoning of this parking lot may hinder the potential redevelopment of that parcel. The eastern portion of the parking lot is owned by New York State and the western portion is owned by the Huntington Station Renewal Agency. Both of these parcels are already zoned C-6 Huntington Station Overlay District. Renaissance Downtowns, produced a development strategy that was approved by the town board on June 4, 2013. According to Renaissance, the strategy identified a number of land uses that people from the community would like to see in Huntington Station. Renaissance claims that hotels are the only use that has been identified by the community as something they would like to see in Huntington Station and is not currently permitted in the Huntington Station Overlay District. Renaissance feels that a boutique hotel would be suited for this area and they are considering building one next to the community first aid squad in Huntington Station. The hotel concept is currently envisioned at the southwest corner of Railroad Avenue and New York Avenue which is currently commuter parking lots. A Boutique hotel is a term usually used to describe hotels which contain luxury facilities with full service accommodations and are furnished in a stylish manner. They are typically found in major cities like London, New York, and San Francisco or islands, mountains or resort destinations. Often boutique hotels have on-site dining facilities, bars and lounges that may also be open to the general public. They are somewhat similar to the concept of a bed and breakfast. At this point, there are no specific plans for what the Huntington Station boutique hotel will look like or what it will include. Renaissance says they are interested in completing this project because they feel it will have numerous benefits to the community and the community has asked for it. They claim that at various meet ups community members discussed the need for a place for their family members, friends and visitors to stay when they come to town and for a community gathering space for special events. Renaissance feels this addresses the lack of hospitality facilities in the area and could meet the needs of visitors, Paramount and Village patrons, business people traveling to and from New York City, family and friends traveling for services at M.A. Connell and A.L. Jacobsen Funeral Homes, and attendees for special events at the hotel or events at neighboring country clubs. The boutique hotel could host a banquet room for weddings, parties, conventions, and business gatherings with the convenience of the Huntington train station. Supporters feel that a hotel would bring tax revenue and would not add a burden to the school district. Others are concerned that tax abatement deals could be made, as has become common place on Long Island. Supporters of the hotel idea say they want to see something finally built and that this would be a better option than empty parking lots. However the parking lots are currently used and would have to be replaced in another plan. Others are less enthusiastic and are jaded by the deceit and empty promises of the past surrounding the Huntington Station revitalization. While we haven’t come across anyone who is adamantly opposed to the idea of a boutique hotel, there is cynicism surrounding the project and concern over the rezoning that is being requested. Some even feel the hotel concept is another ploy that is being used to change the zoning to allow for higher density and that a hotel will never be built. Renaissance is asking for a zoning change to allow for hotels in the entire Huntington Station Overlay District (see map above). They are requesting this zoning change to take place before a feasibility study has been completed. They claim this is necessary because it will give them other options within the Overlay District to build the hotel if it turns out that it cannot be built on the parcel they are currently considering. Since this zoning will supposedly be restricted to the Overlay District, some feel this logic is questionable. It still limits the placement of the hotel. Other critics feel this change in zoning would leave any C-6 zoning area in the entire town of Huntington vulnerable to higher density zoning. Many Huntington Station activists feel that this is simply another ploy to bring taller buildings and high density housing to the Huntington Station community. They feel it is too easy to call something a boutique hotel and then change it to a housing development or anything else after it is built. Other objections expressed include that this is not a logical first step to revitalization. Some feel the community needs to become a destination first before people will go out of their way to spend the night or vacation in Huntington Station. Perhaps the most cynicism comes from the fact that most active residents do not believe this was a grass roots effort and they are confused as to why it is being presented as such. We have made many attempts to reach out to individuals who have been active in the Huntington Station revitalization scene and most are scratching their head as to where this idea came from. At the source the station website, community members can post their ideas. If there is enough interest in an idea by other community members, Renaissance Downtowns will begin a process to see if the idea can be incorporated into the revitalization plans. The idea of a boutique hotel was posted on the Source the Station website on September 4th, 2012, by someone named Wayne. Since then he has acquired 66 likes for the idea. We have been unsuccessful in finding Wayne. Representatives from Renaissance were not sure exactly who Wayne is. If approved, anyone wishing to build a hotel will be required to go through an approval process. Some requirements include; before a hotel can be approved it must be connected to a public sewer district; the property must be at least one acre in size, the hotel must be close to the street sidewalk to promote interactions with other commercial businesses and access to mass transportation, and shall not be located in the center of the property surrounded by parking lots. The public hearing is scheduled during the town board meeting on December 10, 2013 at 7:00 p.m. at Huntington Town Hall.